Once A Mighty Bomber, A B-52 Meets Its End In The Desert The Air Force on Thursday destroyed the last B-52 bomber required under the New Strategic Arms Reduction Treaty with Russia. A crew used a circular saw to cut through the plane's aluminum skin, the tail section separating from the fuselage with a loud thunk and officially rendering the bomber useless. A view of a B-52 about to have its tail section cut at Davis-Monthan Air Force Base in Tucson, Ariz.
A relic of the Cold War met its end on Thursday. The Air Force destroyed the last B-52 bomber required under the New Strategic Arms Reduction Treaty with Russia. A crew used a circular saw to cut through the plane's aluminum skin, the tail section separating from the fuselage with a loud thunk and officially rendering the bomber useless. Truth is, this particular bomber hadn't flown in more than 20 years. It's been sitting with thousands of aircraft in the desert at what's known as the boneyard, the Davis-Monthan Air Force Base facility for retired aircraft. Back in the day, though, it dropped conventional bombs over Vietnam. It also carried nuclear bombs. If you've seen Stanley Kubrick's classic dark comedy Dr. Strangelove,, you know the type of plane. In the movie, actor Slim Pickens rides a nuclear bomb as it's dropped on the Soviet Union. In real life, retired Gen. Earl O'Loughlin says B-52s were a powerful deterrent to nuclear war. "The fact, I think, that we had them up there all the time during that period of time in the Cold War kept us out of trouble," O'Loughlin says. O'Loughlin used to pilot these planes. He got emotional watching the big bomber being dismantled. "It's bittersweet. ... I've flown them over the last 24 years of my career. You get to love them like an old car," he says. The U.S. still flies newer model B-52s. Two of them recently flew over international airspace that China now claims as its own. But they no longer carry nuclear weapons. Frank Klotz, a retired general who was in charge of the Air Force's nuclear weapons, says both Russia and the U.S. have greatly reduced the number of nuclear weapons under strategic arms reduction treaties. "The United States, at the height of the Cold War, had more than 31,000 weapons in its arsenal. A couple years ago, then-Secretary of State [Hillary] Clinton announced that that number had dropped down to just over 5,000, so that's a dramatic change in terms of the overall capabilities of both sides," Klotz says. 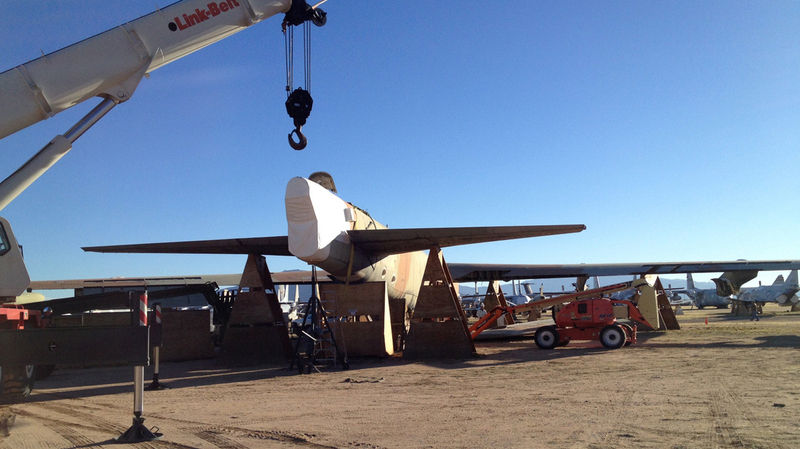 On Thursday morning, the tail section of B-52 #58-0224 was set down at an angle away well from the fuselage. That way Russian satellites can see that the plane is destroyed.